Ealham, Chris and José Peirats Valls. The CNT in the Spanish Revolution vol 2 . Christiebooks: 2005. 31 + 270 pages, illustrated. Translated by Chris Ealham and Paul Sharkey. Part of what is in effect, the 'official' anarchist history of the Spanish Civil War, full of primary documents. Volume two covers 1937-38, the counter-revolution and the Council of Aragon. It also contains a biography of José Peirats. 9781873976241 £17.00 Only available in the U.K. Find at a local library. Ealham, Chris and José Peirats Valls. 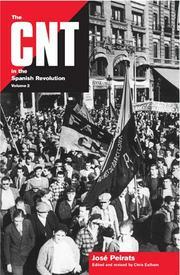 The CNT in the Spanish Revolution vol 1 .